WARNING: If you are a vegetarian or vegan – STOP READING NOW and quickly hit the back button and do not read any further. Are you still there? Okay—good, at least I didn't scare everyone away. 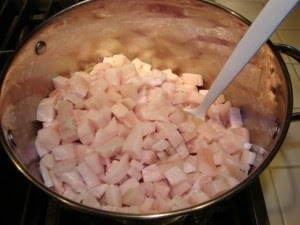 Join me in an in-depth look at rendering homemade lard. It's not as bad for you as you may think especially when you purchase high-quality fat from your local butcher. My butcher's meat is the best quality, and the animals are from smaller farms that take great care in feeding organically. Ask before you buy! 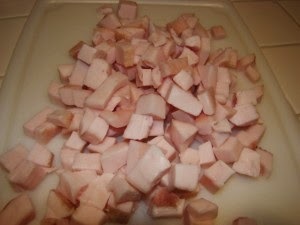 If you are under 45 years of age, you most likely are cringing now at the mere mentioning of the word lard. The word itself does sound pretty icky I admit. The name has been vilified and we've been taught its an unmentionable because in order to be healthier we should all focus on low-fat options. 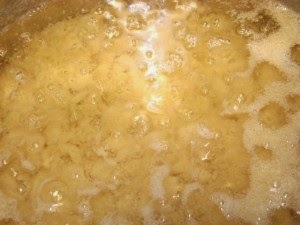 Home rendered lard and its poor unappealing name actually isn't as bad for you as you may think. It is an excellent source of vitamin D. It has no trans-fat which are truly the fats that everyone needs to avoid. But, don’t believe anything unless you do the research yourself which I hope everyone will do. Just make sure that your research is on home-rendered lard not the toxic stuff you buy at the grocery that has been zapped with all those chemicals that allows it to stay on the shelves indefinitely. Finding quality pork fat is a bit harder than you may think so don't give up if your first venture to obtain it leaves you empty handed. I actually felt a little silly calling around to butchers and asking for pork fat and then saying that I needed either the back fat only or leaf fat. I was afraid that they wouldn't know what I was talking about or worse – some crazy lady wants to buy fat (as all the workers are laughing uncontrollable). The first place I called said they had it and I drove down all excited. When the butcher brought it out, I noticed that there was an awful lot of meat on it and it made me pause. 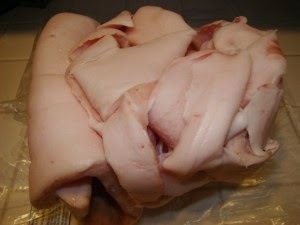 I asked him “is this pork fat that is from the back only?” His reply was no, it is just fat that we cut off the meat. But what meat I asked? All meat was his reply to which I politely said no thank you that I needed it to be from one animal and it needed to be from the back of the pig. In Portland, you can purchase it at Gartner’s Country Meat Market. The staff there is always friendly and the shop displays their goods beautifully. I could have easily bought one of everything it looked so good. I asked for the pork fat and the young man came back with a 5.5 pound of the most beautiful, white fat that I've ever seen. I asked him are you sure this is just pork fat and that it is from the back. He simply smiled and said absolutely and that they keep it on hand all of the time because it is very popular. YEA…I’m not weird after all. Other people buy it too! 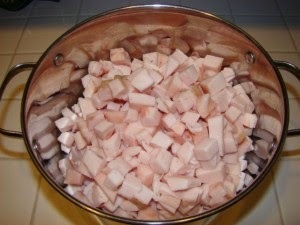 Note: If you are able to get leaf lard, it is your first choice for the pork fat. It is the fat that surrounds only the kidneys. My lard was frozen when I got it. By the time I got back home, it had thawed just enough that I could break it apart with a strong knife. Be careful as you continue to do this because as the fat thaws it gets slippery. If it starts to get too much at room temperature, just put in into the freezer for 20 minutes or so while you continue on with the still frozen pieces. 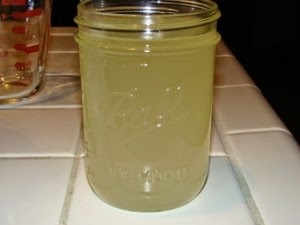 · In large pot, fill it up with water and insert ball jars. You will want to boil the jars and then keep them hot. Never put hot liquid into a cool jar or the jar may break! 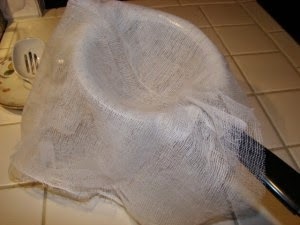 · I used two glass measuring jars, cheese cloth, and one mesh strainer. 1. Cut fat into ½ to 1 inch strips. (if you have a meat grinder, you could also grind the fat). The smaller pieces you start with, the faster the process will be. 2. 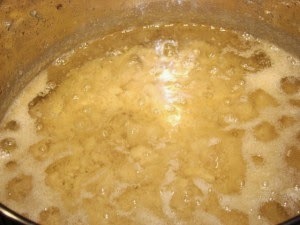 Add fat to your stock pot (I used my 8 quart stock pot). 3. Add water to pan. This part is just to help keep the fat from sticking to the pan and to aid in the initial melting process. Add enough water to bring it up to 1/2 to 1 inch of the pan you are using. 4. Turn heat on. Initially, I put the burner on medium until it started bubbling a little and then I turned it down to low. You do not want to scorch your beautiful fat so leave it on low. 5. Stir fat often. I probably did this more than I needed to but it was fun to watch the process. 6. As the fat begins to melt, the water will evaporate and you will be left with pure fat. During the melting process, I used my potato masher and squished the fat every so often to help in the melting and then I got an idea to try out my stick blender. I put the blender into the fat and slowly and with short bursts chopped up the remaining fat. It worked beautifully. This sped up the process a lot. 7. Once you get a clear, pretty liquid on top you can start removing the fat and putting it in the jars that you have already simmering in hot water. I removed one jar and used a paper towel to dry the inside of the jar. 8. Dip the clear fat from the pan and into the first glass measuring jar that has the strainer on top and cheese cloth lining the strainer. I strained the liquid twice because I wanted to eliminate anything getting into the jars but pure fat, but you don’t have to do the second straining if you don’t want to. The spoon I used held ¼ cup so I was able to fill my jar pretty quickly. I think it took only 4 dips. 9. Put the jar into the freezer for about 30 minutes. You will want to cool the fat as quickly as possible. This makes the lard better and smoother. As it hardens the liquid will turn a beautiful white. I numbered my jars so that I would be able to tell which jar would be the purest for baking. I ended up getting 5 jars plus just a smidge more (three that were nearly pure white and the last 1 1/4 jars were a savory golden that will be great for non-baking recipes. 10. 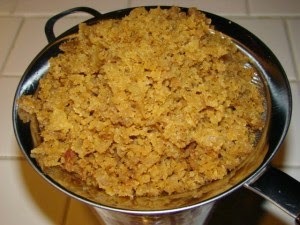 When all of the fat has been removed from the pan, you will end up with crumbly bits that are called cracklings. DON’T THROW THESE AWAY! Allow them to cool and put in a freezer bag. These are great to use just like the dried onion bits that you put in green bean casserole or they are also excellent in cornbread. Now, believe it or not they are NOT salty. I couldn’t help it and put one in my mouth and was shocked that it was not salty at all. You actually would need to salt the cracklings which allow you to control your salt intake. 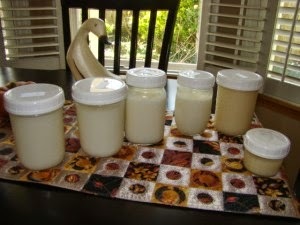 Keep one jar of lard in the fridge and freeze the others. Lard will last a really long time (a year or more) in the freezer. Lastly, I wanted to also say that before I started I worried that the whole house would smell like pig. You know how bacon can really smell up the house. Instead, the smell was kind of a warm, meaty smell – not bad at all. The smell did increase at the end of the process but dissipated very quickly. It was late in the evening (past 10 p.m.) when I finished and by 5 a.m. the next morning, you couldn’t tell I had cooked anything. I hope you enjoyed following my lard rendering adventure. P.S. 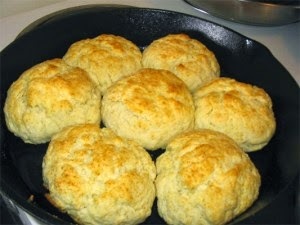 Eating biscuits made with your home-rendered lard is an experience you and your family will treasure for years to come. 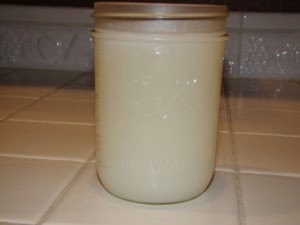 The lard you make at home is at its purest form and impossible to get anywhere else but from your own kitchen. As in most things, Purity Matters, but even more so with lard. Amazing Tutorial JoJo, Love your blog, thanks for sharing. Carol Derouin Freeman from Facebook Gentle Group!